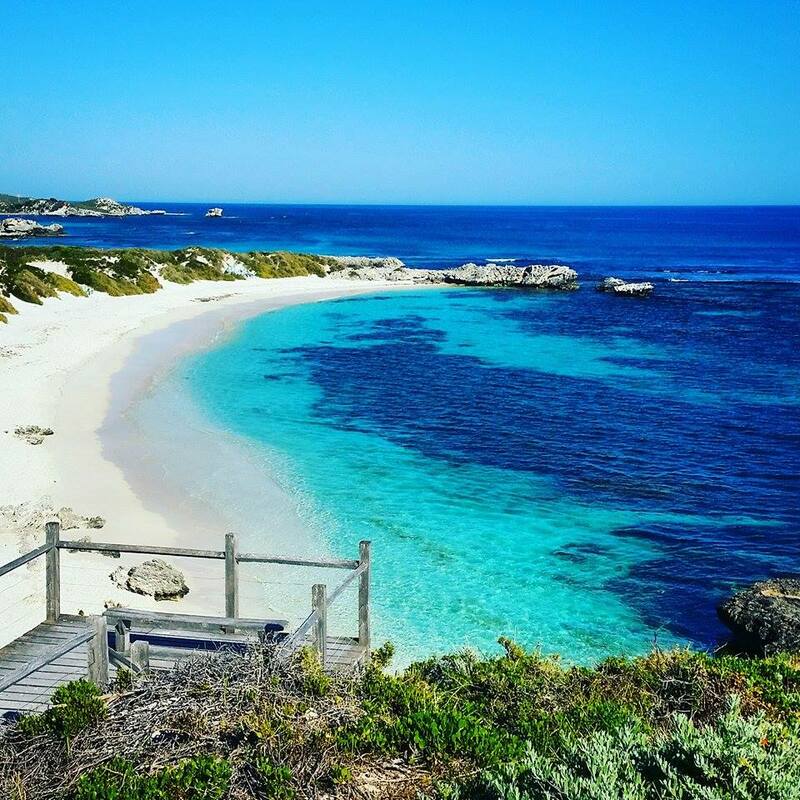 Rottnest: Take me to the island! The amazing view from the lighthouse. We had a perfect weather day for our day trip to this magical little island. All morning I sang the very catchy advertising tune “Rottnest take me to the island”, to the point where my friend nearly wanted to knock me off my red hire bike! I was so excited! As we spun around the island on two wheels, I was pumped, I was over joyed, we were having ‘the best day ever’. But first, let me start at the beginning. 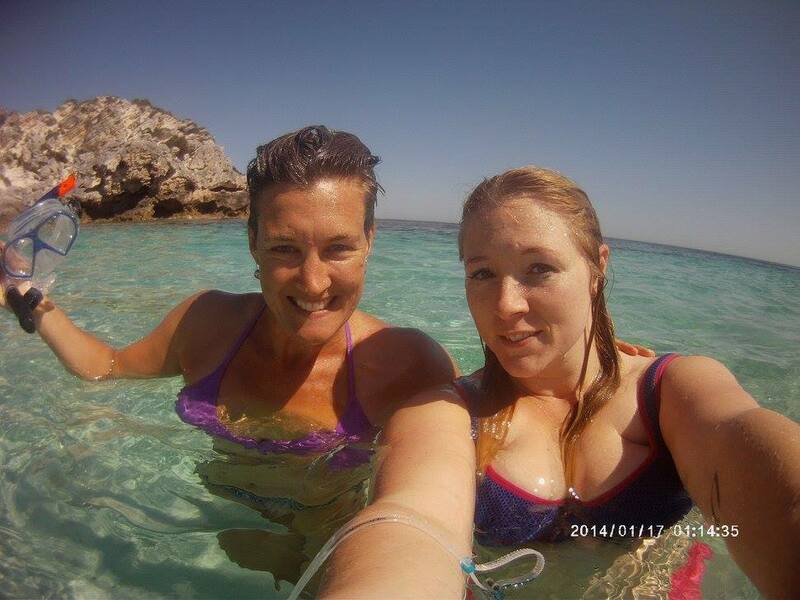 I really wanted to take my friend Sophie to Rottnest before she heads off on her next backpacking adventure. We booked our adventure day trip a few days before and off we were! We were both super excited about our big day out. I used to travel to Rottnest Island when I was a child fairly frequently. Rottnest is situated off Perth coastline about 45 mins by ferry. On a clear day you can see it from the local beaches in Perth. It is a magical place, with magical creatures, called quokkas, and all sorts of other wonderful things like peacocks and snakes (okay maybe these are not the best part). Dad and I would stay in tent land and I would often bring a friend with me. We would hire bikes and ride all around the island, it used to be so much fun, and you know what? It still is!! The ferry journey over was smooth, the new ferries these days are bigger and what was once a fairly stomach churning activity is now so much more enjoyable on a stable big boat. We receive our hire bikes from the boat when we land on the island and ride them immediately. I am pumped. I love riding bikes! We make up a rough plan of attack as we start our cycle and decide the first place to explore is downtown, and get a snack from the bakery. AND high on the list was seeing a quokka. Quokkas are everywhere on the island but it takes extra patience and skill to get a good quokka photo. My friend Sophie fell in love with the fluffy creatures and captured a great shot with a mamma and her baby. They really are the cutest little things, and can only be found on Rotto. 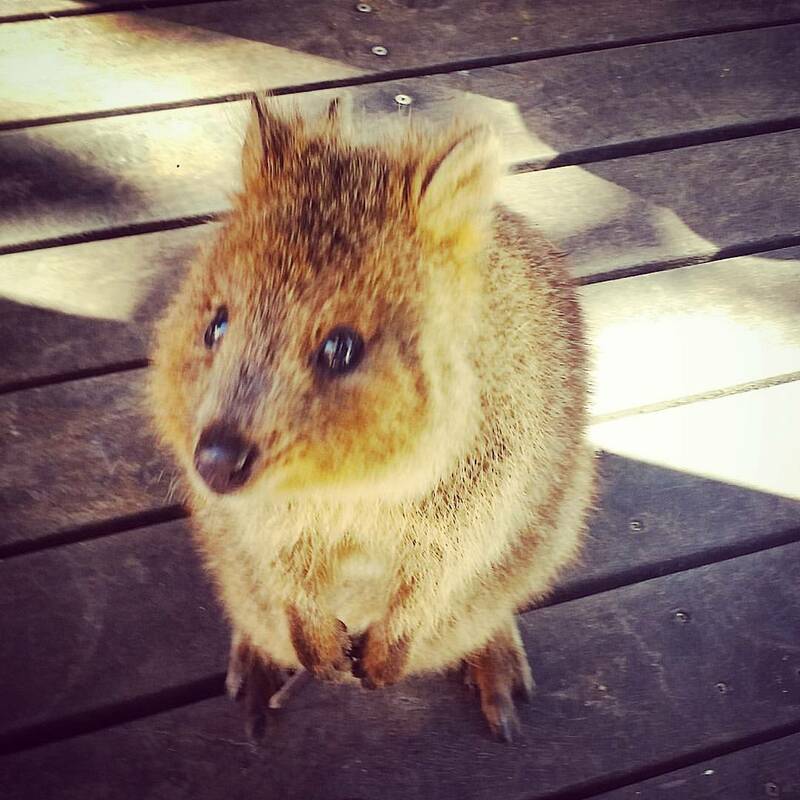 This is a pic of a cute little Quokka!! After a quick browse at the stores and a walk around we jumped back on our bikes and headed for the lighthouse. We came across an epic view to begin the day, beautiful blue water and pure white sand, it is a very picturesque island; and then we were off to ride a little more. 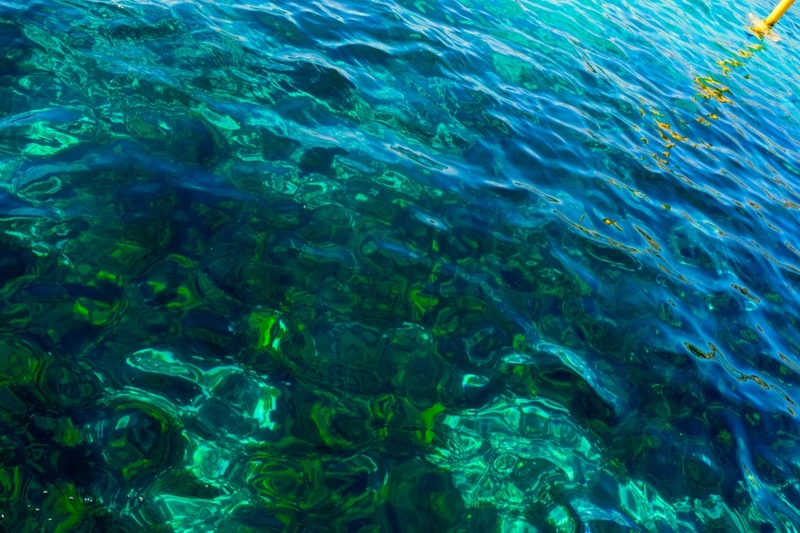 We took off for the basin, a really pretty aqua blue patch of water, perfect for snorkelling. We rode on a little more at first to explore then come back and set up on the beach for snorkelling. So much fun in the water!! The water is crystal clear but freezing, our sun warmed limbs and sweaty riding bodies took some adjusting. Soon we were away and snorkelling out around the reef. I was careful not to go too far, there are sharks not too far out from Rottnest. You would have to be very unlucky to be eaten though! A few years ago an American tourist went out spear fishing and was silly enough to hang his catches from his waist, appearing to be giant bait to a hungry shark. Sadly he was munched by a shark, that was a bad day for tourism, but he wasn’t being very smart about his fishing methods I must say. This is the amazing reef at the Basin where we went snorkelling. We then baked on the beach for a few minutes to dry off before heading back on our bikes to the jetty. We had booked in to go on a jet boat adventure tour! So cool! Almost the last to board we secured two seats at the back of the boat, and although I was disappointed at first, by the end I was pleased for my choice. The innocent lady skipper, on her little step up to see over the wheel, roared the engine with full force as we sped out around the outskirts of the island. It was thrilling, fun and exciting and crazy all at once. Who was she?? LOL! If you were at the front it was even more of a rollercoaster, so I was pleased with our more tame back seat location. Not long into our journey we came across a few humpback whales frolicking around slowly flicking there tails and gliding in and out of the water so effortlessly. The last I saw whales was on a tour off the coast of Vancouver, so it was really exciting to see them so close to home. The humpbacks follow the same migration path every year and just so happen to pass near to Rottnest, lucky us! We also saw seals and bottle nose dolphins at the other end of the island. I can highly recommend the jet boat ride. It was so fun to zoom through the water at high speeds curtailing it over waves and swell and carving it up like a Christmas ham! Seriously that skipper was amazing! An artistic shot of crystal clear water on the far side of the island. This was the view from the adventure boat. Next on our fun day was lunch, we chose to go to Dome and both ordered our favourite wraps. Mine being the roast vegetable one and Sophie ordered the lemon chicken one. I am pretty consistent with food choices I must say. This could be the 8th time I have had this wrap, and it is just as good as the first time! I especially love all the vegetables and the amazing tomato chutney they serve with it. Try it! Then we decided to go play mini golf, and wow did we have fun!? Sophie’s approach was whack it hard and hope for the best, and surprisingly that worked really well, together with our fits of giggles and high fives for our holes in one. We both got at least one of those so that was awesome. Although I actually play golf it doesn’t mean much on a mini golf course! I was down 4 points after a shocker 9 pointer where the pesky ball refused to get in the hole! By the end of the second round, our scores were tied. We aimed to play a bit more then lost the ball down the chute on the 18th… damn, that was a smart play! After breaking a sweat at mini golf in the hot afternoon sun, we rode our bikes back to another calm snorkelling spot near the lighthouse. Here we enjoyed swimming again and seeing more fish and even an octopus on the reef, Sophie was super excited about that. 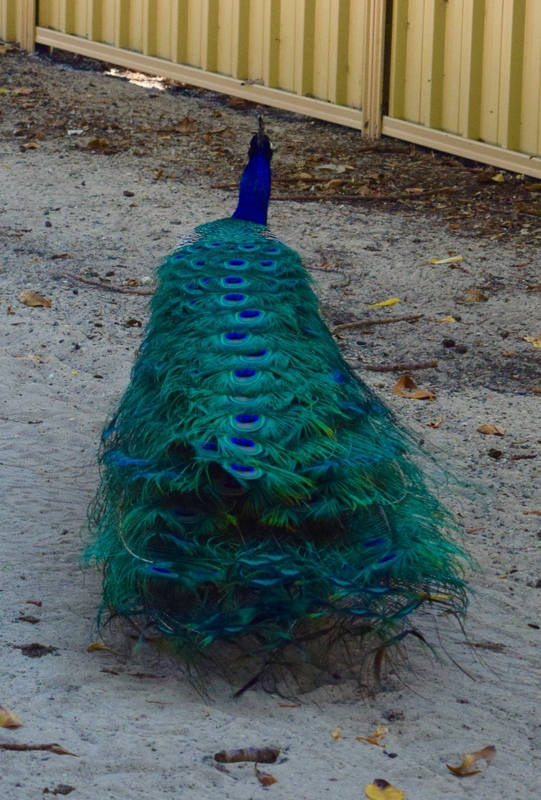 I finally spotted a peacock on our last ride back into town, I scurried after it trying to get the best shot possible, but it was being very shy. I love these colourful birds and I really love that they have been on the island for so many years. Although he had his back to me you can at least see how awesome the feathers are!! Before we knew it our epic Rotto adventure had come to an end, we really had the best day trip!! As we passed our bikes back to the guys on the boat we boarded wearily, tired from all that sun, sea and cycling, but so happy and pleased that we had been so adventurous. I highly recommend taking a day trip or overnight stay to Rottnest it is an amazing place to visit. 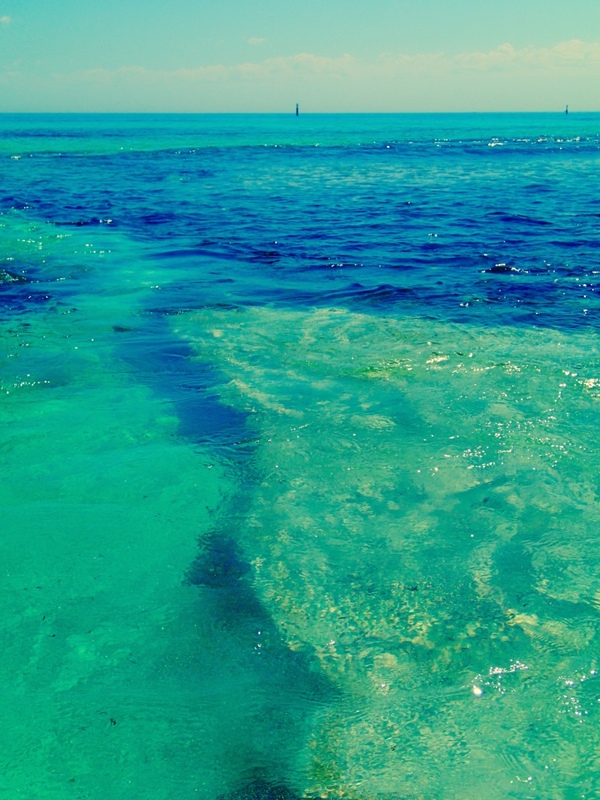 Next week I am going to Jurien Bay so stay tuned for that post! P.S. We did not see any snakes!! YAY!! Literally 45 mins by ferry! So good!! Sounds like a fantastic day and Quokkas (what a funny name) are cute. Sounds a bit like squirrels, who remind me too much of rats. ← Indecision: No decision is a decision right?